The Affordable Care Act expanded access to Medicaid programs and required them to provide essential health benefits, which can include prevention services. This study assesses the costs and benefits to using Medicaid funding to implement a well-known evidence-based program, Functional Family Therapy (FFT), with a sample of juvenile justice-involved youth. The study also provides a rigorous test of FFT accommodated for a contemporary urban population that is gang at risk or gang-involved. One hundred twenty-nine predominantly minority and low income families were randomly assigned to receive an enhanced version of FFT or an alternative family therapy. Data from pre- and post-intervention interviews with youth and parents, court records of contacts with the justice system and residential placements, official records of community services, and the costs of placements and services are summarized. The intervention was implemented with fidelity to the FFT model using Medicaid funding. Treatment and control subjects received a wide range of community and residential services in addition to FFT. A higher percentage of treatment subjects than controls received services following random assignment, but the cost per youth served was lower for treatment than control youth, primarily because control youth were more often placed in residential facilities. Recidivism during the 18-month follow-up period was lower for FFT than for control youth. The combination of cost savings realized from avoiding more costly services and the expected future savings due to recidivism reduction suggest the expanded use of evidence-based practices using public funding streams such as Medicaid is warranted. The online version of this article ( https://doi.org/10.1007/s11121-018-0936-z) contains supplementary material, which is available to authorized users. We are grateful for support from the Centers for Disease Control and Prevention and the Office of Juvenile Justice and Delinquency Prevention during the development phase and from Smith Richardson Foundation and the National Institute of Justice during the implementation phase of the study. We wish to thank the Honorable Lori Dumas, Chief Faustino Castro-Jimenez, William Cooney and many other partners in the Philadelphia Family Court system for their leadership and guidance, Mike Robbins and Helen Midouhas of FFT LLC for their support, and Courtney Harding and Joe Pitts of Temple University for data collection. We also thank Associate Editor Abigail Fagan and two anonymous reviews for their constructive comments on an earlier draft of this report. The study was funded by Centers for Disease Control and Prevention, Office of Juvenile Justice and Delinquency Prevention, Smith Richardson Foundation and National Institute of Justice. Informed consent or assent was obtained from all individual participants included in the study. Campbell, E. M. & Bumbarger, B. K. (2012). 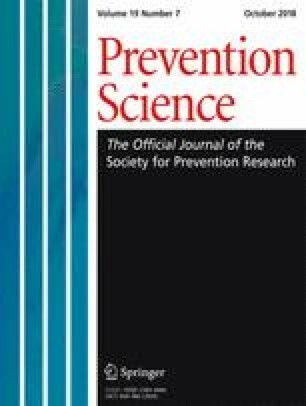 Looking back, moving forward: the history and current state of evidence based intervention in Pennsylvania. Retrieved from: http://www.episcenter.psu.edu/EBIReports/lookingbackmovingforward. Mihalic, S., Irwin, K., Fagan, A., Ballard, D., & Elliott, D. (2004). Successful program implementation: Lessons from Blueprints. Available at: http://www.ncjrs.gov/pdffiles1/ojjdp/204273.pdf. Sickmund, M., Sladky, T. J., Kang, W., and Puzzanchera, C. (2017). Easy Access to the Census of Juveniles in Residential Placement. Available: http://www.ojjdp.gov/ojstatbb/ezacjrp/.